Volvo S90 Boot Space, Size, Seats | What Car? Interior space is one of the S90’s strengths; it’s one of the biggest cars in its class. In the front even the tallest folk should find there’s plenty of head and leg room, while someone equally tall sitting behind them should still have space to spare. The only issue is the wide central tunnel, which robs rear foot space for the third passenger sat in the middle. 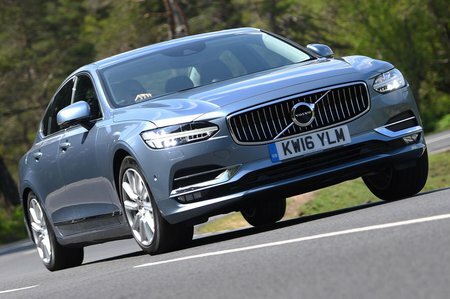 The S90's 500-litre boot doesn’t quite match that of a BMW 5 Series’ and falls further short of the Audi A6’s. However, there’s still enough space for a couple of large suitcases and it’s practical: it has a usefully square shape and a wide opening that’ll accommodate bulkier items. It’s also worth mentioning that the T8 hybrid’s boot is no smaller than the regular S90’s. You can fold down the standard 60:40 split-folding rear seats at the touch of a button, located just behind the rear headrests. Once down they offer a long and completely flat extended load bay. The aperture left between the boot and passenger compartment is quite shallow, which does limit the height of any longer items you might want to carry.